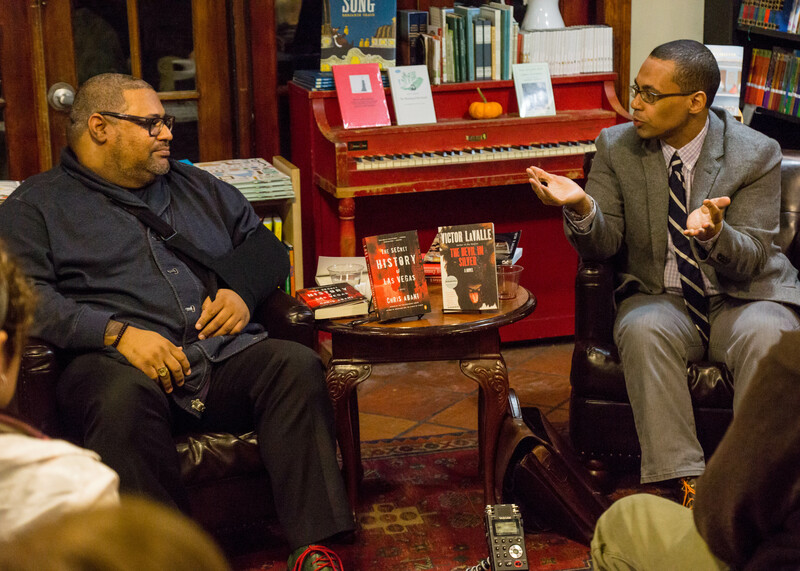 This past Thursday evening, novelists Chris Abani (whose entry in our ongoing short memoir series The Face is forthcoming this year) and Victor LaValle (author, most recently, of The Devil in Silver) entertained a packed house at Brooklyn's Community Bookstore. What proceeded was a challenging, freewheeling, and often hilarious dialogue on the complex web of transnational politics and cultural reference that informs Abani's audacious, multifacted, and, at times, brutal work. Taking as a starting point Abani's new book, The Secret History of Las Vegas, the conversation touched on everything from that novel's noirish exploration of the intersection of global North and South in the titular city to the importance of genre technique in "literary" writing. Abani's ability (rooted, he explains, in his youth in the post civil-war Nigeria of the 70s) to negotiate and articulate the overlapping spheres of experience that constitute our world, made for an essential discussion of the forces that shape our stories—and ourselves. Hear it below (and look out for a transcript soon).